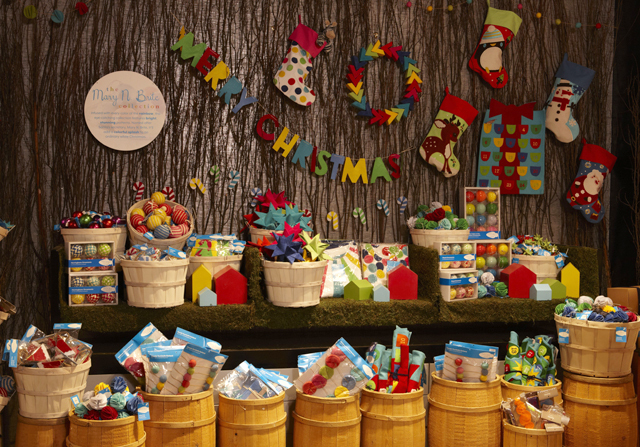 Something Cool: Santa's Workshop is in NYC at the Land of Nod!! Unbelievable, but true!! November is over, the holidays are just around the corner, and our list of things-to-do just got three times longer than the usual. Wish lists, letters to Santa, gifts for the little ones, all of this potential shopping is falling on our laps, and we have to act quickly, because December 25th will be here in a blink. Luckily, for all of us in New York, Santa seemed to have moved to the Big Apple and settled his workshop in Soho. 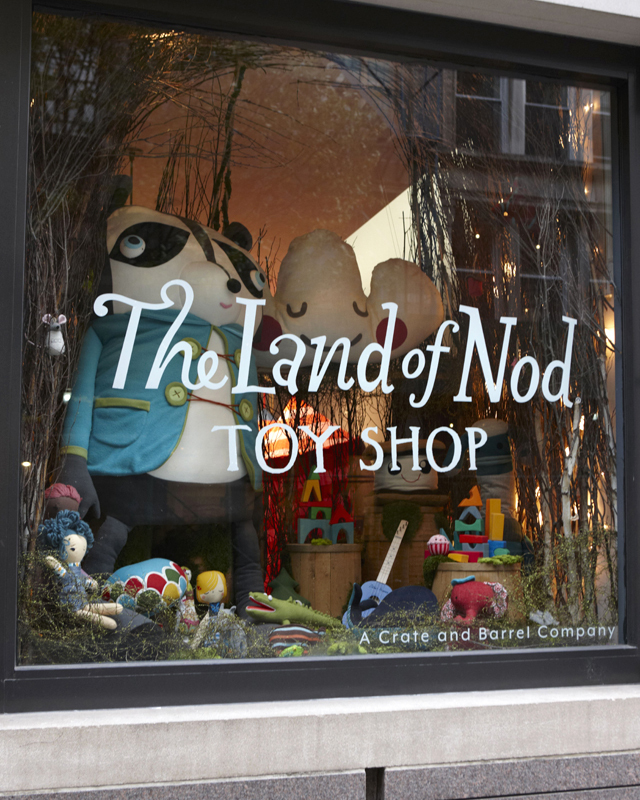 The Land of Nod, the toy store well known for its strong presence online, recently opened a kids' paradise, an enchanted forest themed pop-up store, packed with holiday decorations and many exclusive lines of toys. Eye candy for everyone, the store is packed with the wonderful creations of more than a hundred international artists and toy designers. 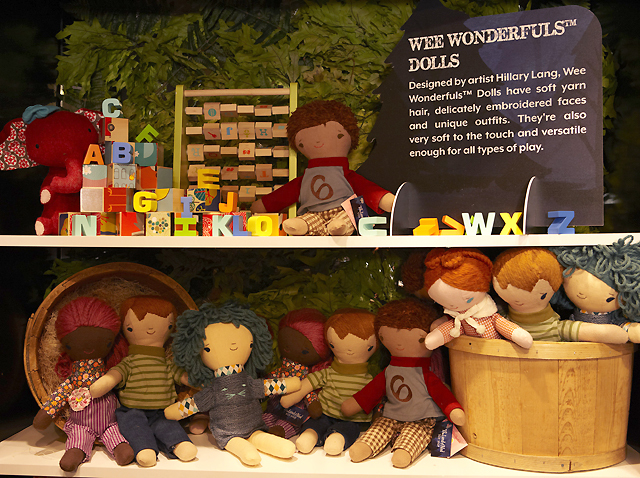 Enormous dolls, wooden toys, and stocking stuffers are artistically displayed through this location, creating a whimsical place in which, children can also enjoy an exciting list of events. Every weekend, for the next three weeks, the Land of Nod is offering face painting, tattoo station, photobooth, craft making and more... Sounds like fun... right? Surely, kids will have a good time and fall in love with that gigantic raccoon displayed at the window from the Monster Collection by Jennifer Strunge... I'm so in love with it!! Not in New York? You can always shop online, but if planning a visit to the shop, follow the link for a schedule of activities and directions. Have a happy, happy weekend!! I must confess, I've never joined the fun of an advent calendar, either as a child or as a grown-up. It sounds terrible... right? It almost makes me feel guilty or like I've been missing something good for too long. In reality, advent calendars are not part of my Christmas traditions from Venezuela and therefore as a parent, now living in New York, I've never paid much attention to it. 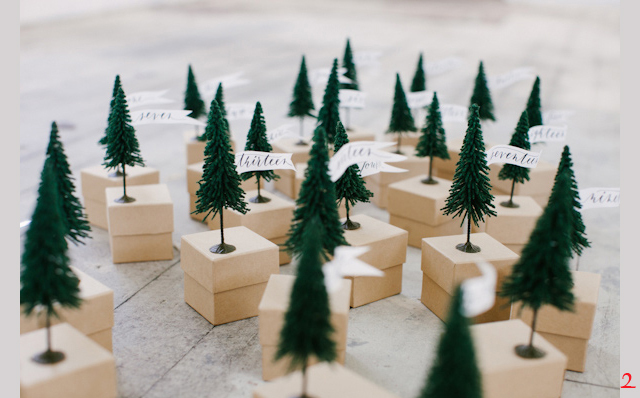 This year, I am all over it and Pinterest has a lot to do with it. There are so many wonderful bloggers, crafters and photographers putting their creativity to test before the first day of December, that I couldn't resist it anymore. This year, I am making an advent calendar for my girls and I'm realizing that there are only two days left to get it done. So, I picked the four favorite projects that really made my heart smile, four creative ideas that are easy and quick to make, using very basic supplies that one can find anywhere. From paper envelopes to mini cardboard boxes, from star-shaped cookies to toilet paper rolls, simple crafts for parents who love to share beautiful things with their kids, but don't have much time for arts... If you belong to this group, join me and take a look. 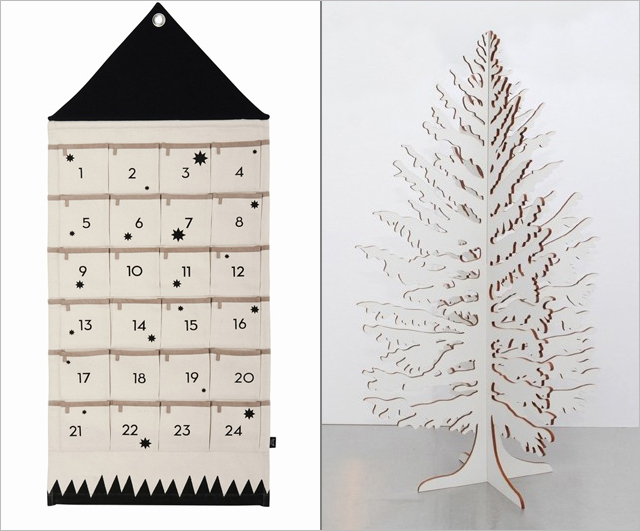 These advent calendars may give you a clue!! 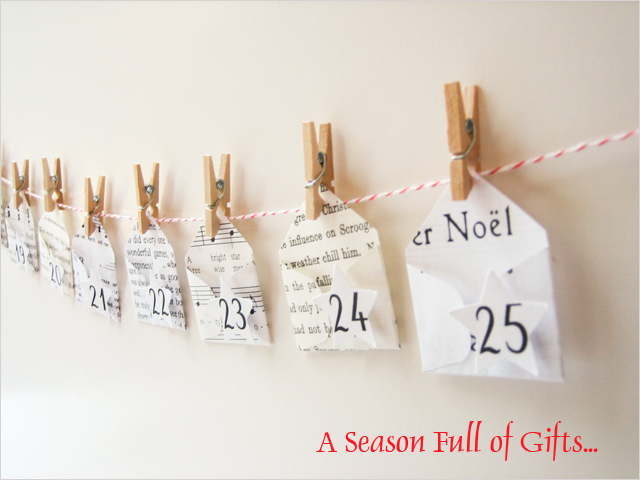 1:: Mini Christmas Envelope- Advent Calendar by Newnanc available here. 2:: Mini Tree Calendar - PDF Free Template by Oh Happy Day available here. 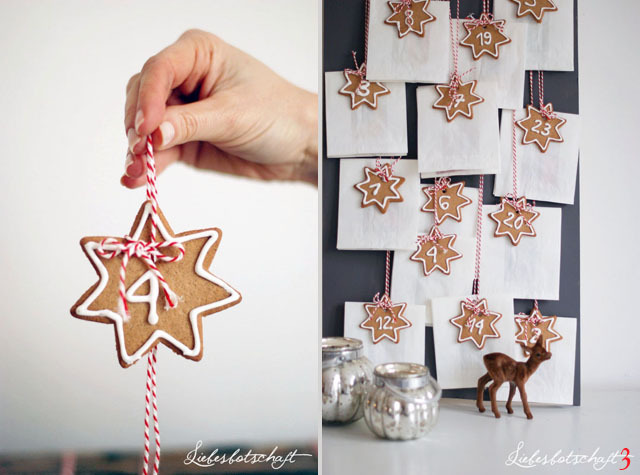 3:: Tea + Cookies Advent Calendar by Liebesbotschaft available here. 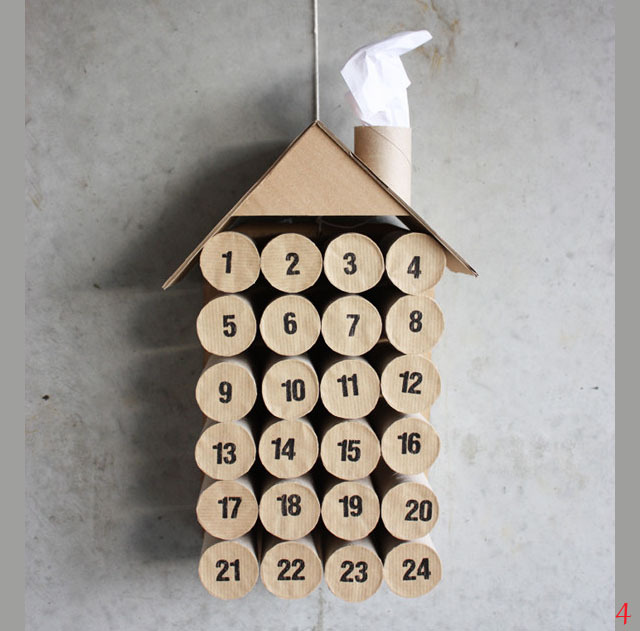 4:: DIY Paper Roll Advent Calendar by Morning Creativity available here. The weekend after Thanksgiving is always a busy one around my house. It's the time to bring back all of those boxes that have been saved in the basement for a whole year, holding dozens of little things, and waiting for December to get back on stage. Ornaments, school crafts, garlands, lights, old family decorations, this is the time to get them all out and enjoy a great day with my girls. I love to see the surprise in their faces each time we open a box and find something that we had completely forgotten about. Of course, every ornament they've made since they were in pre-k deserves a story, and many others decorations we have collected over the years, also get a story. At the end of Saturday, we always realize that we have talked and laughed too much, but are not nearly done... and that is how decorating for Christmas, becomes a weekend affair. On Sunday, when we think that we are finished, I always find an empty spot on the tree that will force me to do a little shopping, so we can complete our Christmas adventure. This year, I have my eyes on black and white decorations. Have you shopped around and realized how trendy these two colors are this year? 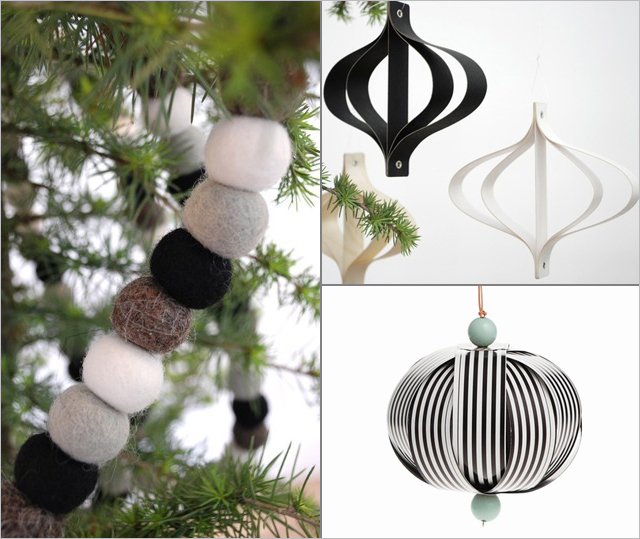 Organic materials and raw elements like natural cotton, wool, clay and wood are definitely a theme, and I'm just fascinated with this collection from Danish design studio Ferm Living- paper and wooden stars, plywood balls, fabric calendars, stockings, felt garlands and mini trees... All so simple, modern, beautiful!! Take a look!! 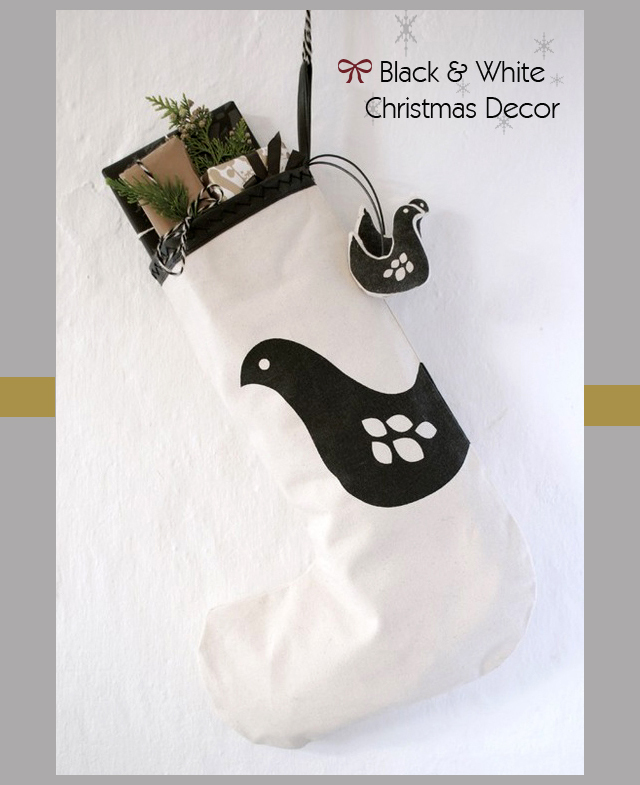 Ferm Living Christmas Collection available here. Well, well... We haven't even finished the Thanksgiving leftovers when winter is already telling us that it is time to get ready for cold temperatures and snow... Yeah!! As we look out the window, mesmerized by the beauty of the first flakes in New York, we are reminded to switch our picks from fall styles to the softest and snuggliest knits for our little ones. Alpaca Society is the Norwegian brand behind these gorgeous designs and we are loving it... A whole collection for babies and kids, entirely made of a blend of Peruvian alpaca and pima cotton. Sweaters, ponchos, dresses, booties, hats, and even a furry bear, are included in this line that exudes comfort and cozyness with the use of the most delicate yarns, colors, and the sophisticated simplicity of Scandinavian styles. If you are feeling like us and can't get over this collection, know that Alpaca Society also has a complete line of sweaters, hats and scarves for us, the big girls... So, think of winter and holiday gifts. Surely, these beauties will fit more than one person in your list. And, here we are again, another year facing the eternal dilemma- What kind of toy, device or gadget could we possibly get for the kids to keep them interested and entertained for a period, longer than the time it takes them to rip the gift wrap? Kiwi Crate is one of our favorite choices for that purpose. Little ones' creative minds can stay active all year round with a monthly delivery, right at your doorsteps, of a crate that contains all the supplies and inspiration necessary to complete a new project or craft... Imagine how exciting it is for a child to get mail with her own name stamped on it, open it up, and find a box full of goodies to have fun. 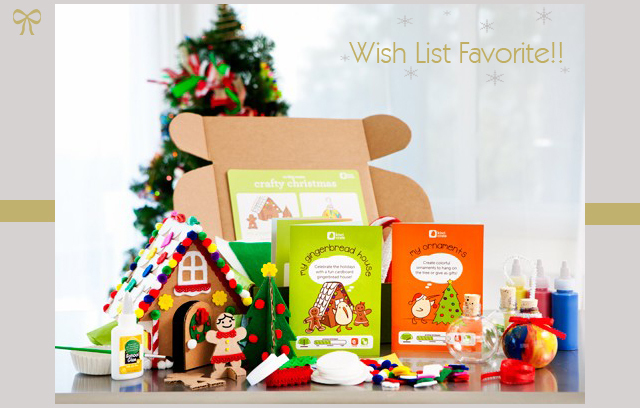 Making it appropriate for this time of the year, Kiwi Crate just came up with Holiday Crates, a group of three different boxes to invite kids ages 3 to 7, to develop their own ornaments, cards, and decorations... Crafty Christmas, Gift Made by Me, and Handmade Hannukah. It doesn't matter what you celebrate. Everyone gets to participate in the spirit of the holiday season and its artistic creations. Whether it is a gift of one crate or a suscription for a different box every month, Kiwi Crates offers many options- a gift for three, six or twelve months, and even additional supplies to a crate, in case of a jealous sibling at home... Call it the "no-fight" crate! Are you loving it already?... Then, hurry up!! Kiwi Crate is offering a 40% OFF on the first month of a new subscription, using promo code HOLIDAY only on Monday, November 26th. Keeping children together and entertained during the Thanksgiving celebration is a "must do" for me, so I can keep every one in a good mood. Thanksgiving may turn into a very long day for kids, and while everyone is waiting for the big meal to be served, grown-ups, especially the ones with the younger kids, deserve to enjoy a peaceful cocktail and a sane, adult conversation... Don't you think so? Preparing a table with supplies for a craft, and having someone volunteer to lead the activity, has proven to be a very successful plan every time we have tried it... Children love to gift their parents and relatives with something that they just made with their own hands. Adults also enjoy taking with them a little something to remember forever that special day of affection and family sharing. 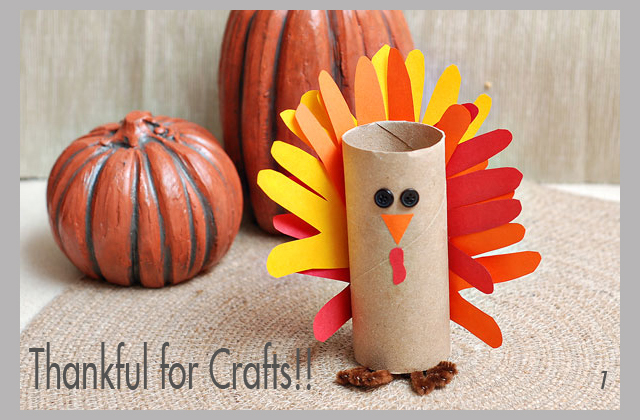 Nothing complicated, but actually pretty, here you have five craft projects that will work very well for Thanksgiving Day. Three different turkeys that may look complicated, but in reality are simple. You just need to prepare and cut all the pieces to assemble them, ahead of time. Kids will work on glueing and putting them together. 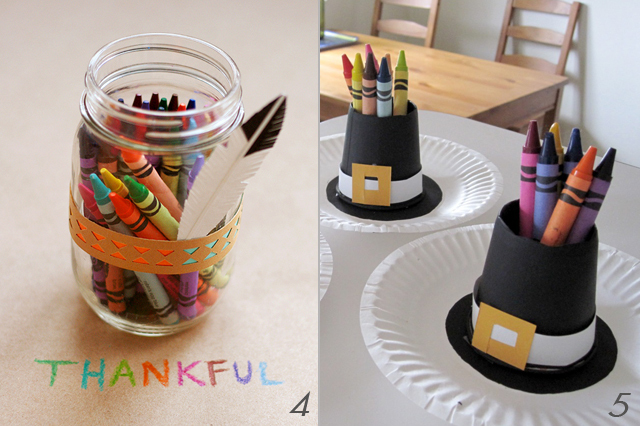 The other two crafts are cool crayon containers that little ones can decorate with their own style and use the crayons to make Thanksgiving cards for their loved ones... Are you ready to get templates and instructions?? 1:: Gobble!! Gobble!! Paper Tube Turkey by Amy Vowles for SheKnows. 2 :: Gourds Gobblers available at AllYou. 3:: Lend a Hand - Felt Turkey Craft available at AllYou . 4:: Native American Headband Crayon Jar by Lisa Storm for Fiskars. 5:: Pilgrims Hats from Paper Cups by Laura Hawkins for Happy Hawkins. Less than two weeks from Thanksgiving Day, it seems like fall is wrapping up early, giving space rapidly to winter and the holidays celebrations. Fall, the season of gorgeous colors and delicious flavors is fading away quickly. Now, the intense oranges, reds and browns are turning into pale yellows, pinks and ochres- a palette that, as we realized, has beautiful gifts to offer to the littlest ones. 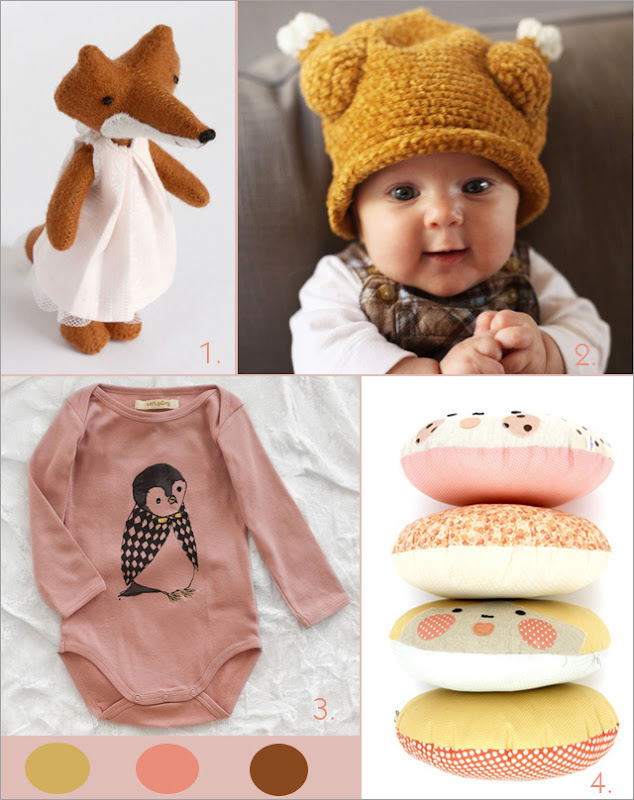 Foxes have definitely been trendy this season, but the ones from fabulous blogger and crafter Mia Giedre Kaubryte and her little shop Manomine are beyond "pretty". There is a small collection of miniature foxes, bears and bunnies equipped with their own tiny wardrobe, bedding and closet, too cute to not to have it. Baby's first Thanksgiving? No problem. How about making a fashion statement with a "Little Turkey Baby Hat" by Melondipity. Those drumsticks on the sides are just adorable, as well as the Sweet Penguin printed on the light pink bodysuit by Soft Gallery... Such a feminine outfit for baby girls!! 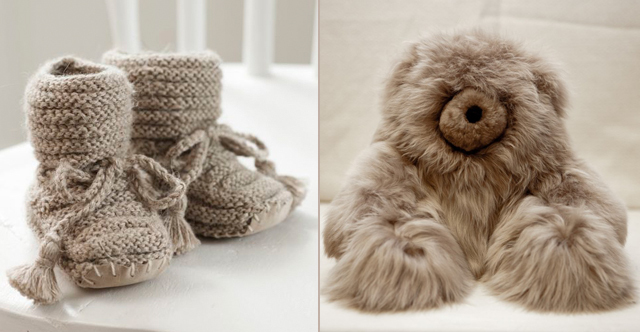 To complete this set of gifts for babies, how about a little decoration? Baby's room will surely get a charming touch with these handmade, polka dotty pillows by La Camille, adorned with kawaii faces combining all the yellows, pinks and browns of this delicate end-of-fall palette. 1:: Foxes, Bears and Bunnies from Manomine available here. 2:: Little Turkey Baby Hat by Melondipity available here. 3:: Penguin Bodysuit by Soft Gallery available here. 4:: Homemade Pillow by La Camille available here. Children reach a certain age in which picking a present for them becomes cumbersome. It seems like there is so much and such a variety of styles for the littlest ones, but once they turn into tweens, guessing what they like, becomes complicated, especially if you want to step out of the common trend of electronics and video games. 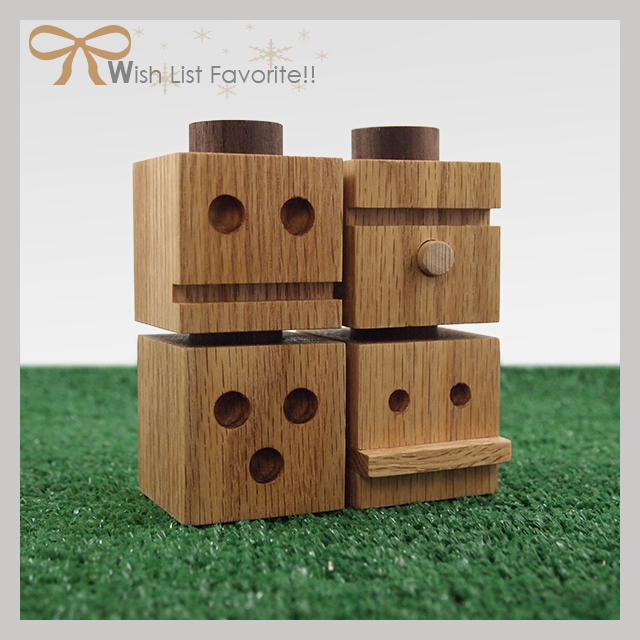 Here is something cool for kids over ten, something decorative that could keep their hands and minds busy for a while... "Totems" is a set of stackable wooden blocks designed by New York based artist and designer Dino Sanchez. Four different faces in a set, each block is handmade in the USA from solid oak and walnut with non-toxic finishes. By the way, I wouldn't mind keeping one of those on my desk... I'm definitely including Totems in my list of favorites, also for grown-ups!! Totems by Dino Sanchez available here. All pictures courtesy of Dino Sanchez' website. Forty weeks, those nine months preceding a baby's arrival, involve so much planning and imagination. Everything requires imagination!! ...from what the baby will look like to how painful the delivery will be, from how many onesies and bottles are enough to get you started to what theme you should choose for the nursery. Out of all of the imaginary trips we take during pregnancy, those related to the baby's room are probably the ones that bring more inspiration, but at the same time, create more confusion. Combining styles, colors and patterns is not an easy job. Adding the theme to this equation, could even make it more painful. Owls, elephants, foxes, so many creatures competing to become the nursery theme... Then, a group of gorgeous pictures, like these ones, get on our screen, and a decisive thought immediately comes to our mind- What could represent better the purity, tenderness, innocence, and sweetness of a baby than a nursery decorated in different shades of white? Digital magazine EST, a quaterly publication dedicated to interior design and lifestyle with an Australian twist, recently posted "Baby Boom with Tamie Freier", a collection of objects and interiors to inspire expecting parents, aunties, grannies, and everyone to create a magical world for children. 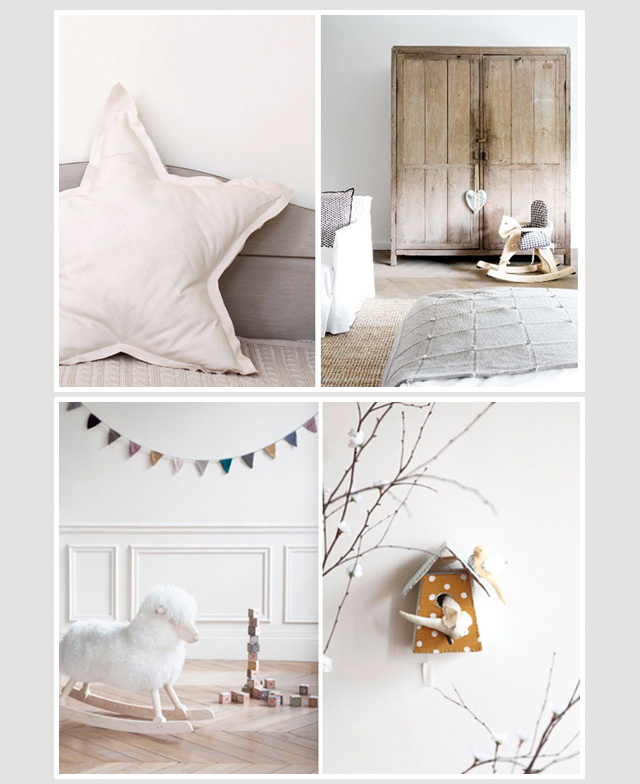 Australian interior designer and stylist, Tamie Freier, has been busily preparing her own nursery and now, she is sharing some of her wonderful finds, combining delicately the color white and neutral tones. 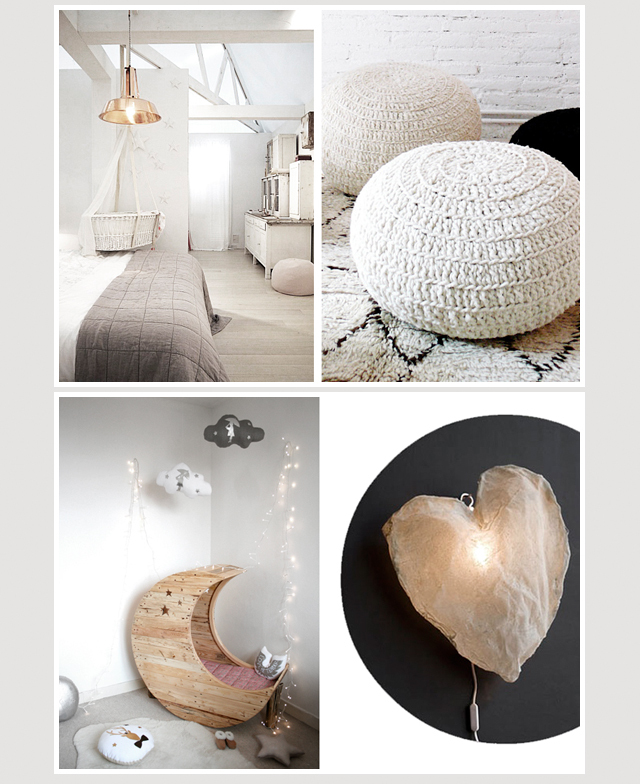 So, get comfortable and head over to EST Magazine to get the links to those fabulous goodies. Baby Boom with Tamie Freier on EST Magazine available here. All pictures courtesy of EST Magazine. Awesome Picks for Kids: Are We All Loving a Moustache? Just when we thought that the hairy style over the upper lip was relegated to old pictures of Charles Chaplin and Burt Reynolds, fashion makes a statement and brings the moustache back, now trendier than ever... Have you noticed that?? Good thing, at least for me- I'm not really a fan of facial hair- the moustache comeback is not happening on boys' faces, but instead, showing as a theme on clothing, home accessories, and in a very cute way, on children stuff. 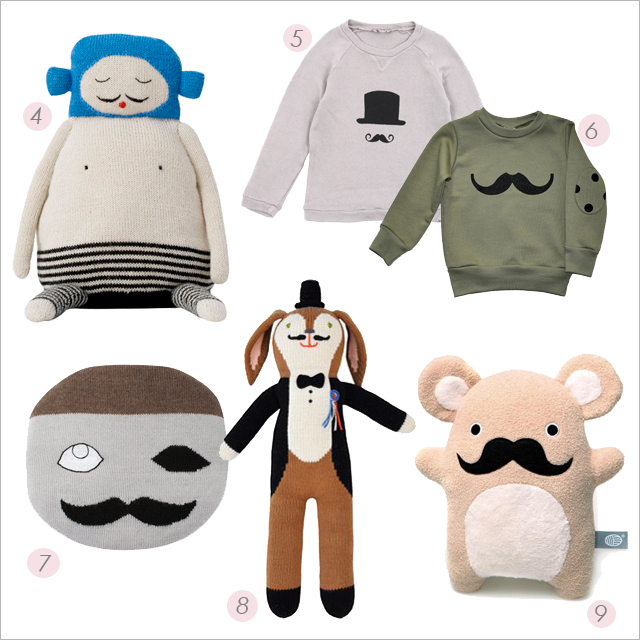 Thin, thick, curly or straight, many designers included a moustache in their children collections this fall and created adorable onesies, tees, pillows, stuffed creatures, and even rubber stamps for little ones to pretend-play with finger moustaches. Thinking of the proximity of the holidays and all of the gift shopping that goes with it, we gathered our favorite moustaches and links... So, take a look and start building your wish list!! 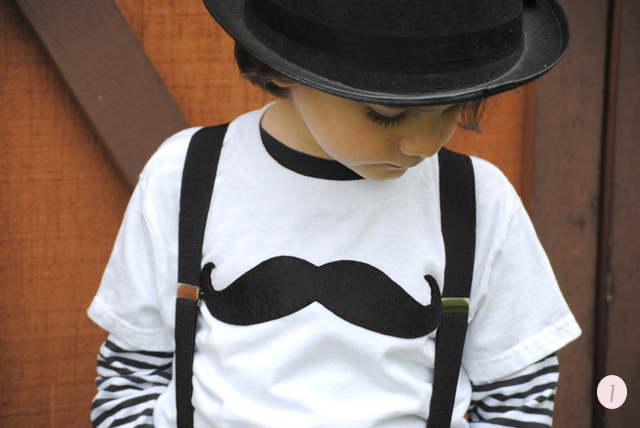 1:: Moustache Kids' T-Shirt by Once Upon a Story available here. 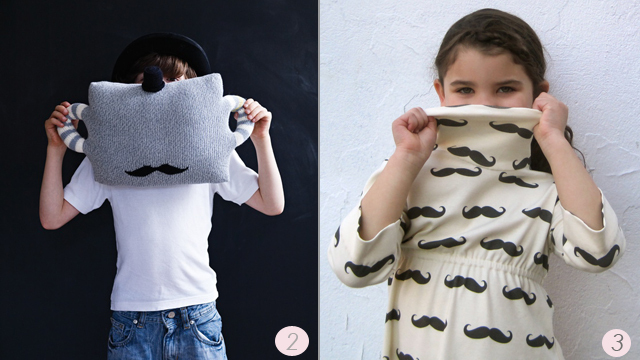 2:: Knitted Moustache Pillow by Bla Bla Kids available here. 3:: Organic Girls' Moustache Dress by Sewn Natural available here. 4:: Balthazar by Lucky Boy Sunday available here. 5:: Hat and Moustache Sweater by Emile et Ida available here. 6:: Khaki Moustache Jumper by Beau Loves available here. 7:: Secret Man Pillow by Lucky Boy Sunday available here. 8:: Balthazar The Magician by Bla Bla Kids available here. 9:: Ricetache Plush Toy by Noodoll available here.